The Joker has finally been revealed on Gotham. After nearly four seasons, the Batman prequel TV series has given us the one and only true Clown Prince of Crime. The reveal was made with a pretty interesting twist thrown in and this has some major implications moving forward. Not just for Gotham, but for lovers of the DC universe in general. Warning: major spoilers ahead for the latest episode of Gotham. Seriously, this is huge so if you're not caught up, now is the time to turn away. 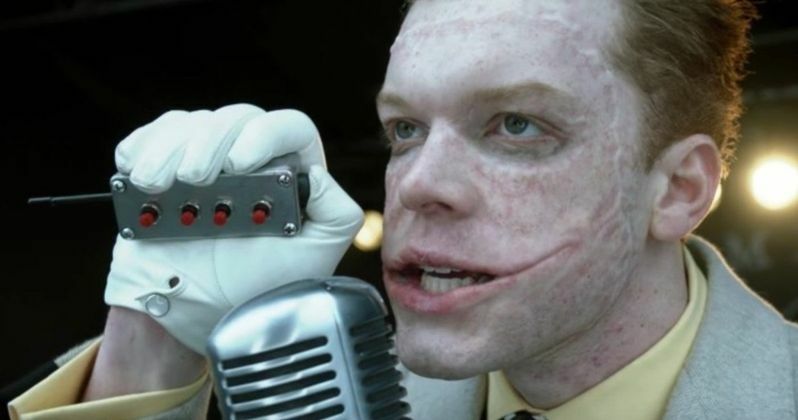 As promised, Jerome, played by Cameron Monaghan, did not turn out to be The Joker. However, Monaghan is still playing The Joker on Gotham, as his twin brother Jeremiah has become the famed DC villain, which is something many had started to suspect would happen in recent weeks. But now it's confirmed. No more dancing around it. The Joker has arrived to terrorize the city. For quite some time, the show's creative team has promised that Jerome was merely a prototype for the real Joker. Gotham season 4 has not been shy about teasing the arrival of Batman's greatest foe. In the latest episode, Jim Gordon killed Jerome, which didn't sit well with Jeremiah. While mourning the loss, Jeremiah returned to his home and found a present waiting for him; a jack-in-the-box from Jerome. The toy sprayed gas onto Jeremiah before playing a message from Jerome, saying that he designed this gas, knowing his days were numbered. The gas would make Jeremiah go crazy and serve as Jerome's revenge. So, even though Jerome didn't become The Joker, he created him. Following the message, Jeremiah began writhing and screaming. However, those screams eventually turned into a maniacal laugh and, in the final moments, we see Jeremiah turn into The Joker, with the pale white face, creepy grin and all. There are still a handful of episodes left in Gotham season 4, which leaves plenty of time for us to see The Joker in action. Outside of what this means for the series, this is huge for the DC universe. The Joker's origin has been left intentionally mysterious for years in the world of DC Comics. That's part of what makes Heath Ledger's Joker in The Dark Knight so effective. We know nothing about him. However, we've now seen the buildup to this character and the origin unfold for nearly two seasons. While this show more or less takes place in its own universe and is creating its own version of how Batman's world came to be, it gives a proper origin story for the villain, which is no small thing. Cameron Monaghan teased previously that he would be playing two characters this season on Gotham. That signified he was going to play The Joker, which has now come to pass. How this will continue to unfold remains a mystery, but we could see some proper Batman vs. Joker action in Gotham season 5, assuming Fox decides to pick up the series for an additional season. You can check out some images of Jeremiah as The Joker for yourself below, as well as the scene depicting his transformation.